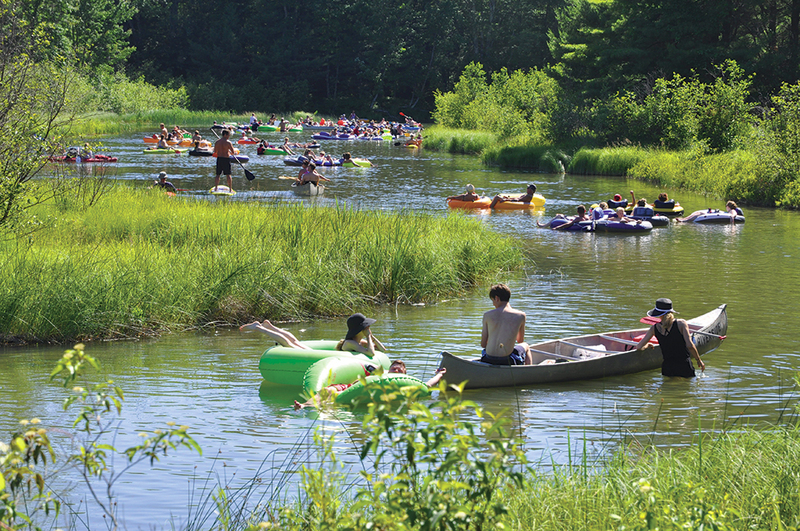 Imagine paddling or floating down the Platte River with your family on a gorgeous Benzie County summer day. The late afternoon sun illuminates a bright blue sky. Near the canoe, a lazy turtle floats. In the distance, a loon calls. And just around the bend… a floating armada of inebriated college students, drinks in one hand, smokes in the other, cheering and singing like buffoons at a fraternity party. Nature interrupted. Full disclosure here: visiting tourists and we locals are both guilty of this bacchanal summer tradition. My friends and I have tossed back a few drinks and sung a few sailor songs while floating down the Platte. One chum of mine has been known to sip from a CamelBak full of gin and tonic. We don’t use glass bottles—still, shame on us. Sleeping Bear Dunes National Lakeshore officials worry that the Platte River party scene has reached a pitch which, if left unchecked, could spell disaster: a child cutting her feet on a broken beer bottle; a drunken reveler passing out and drowning in the river; a pedestrian hit by a moving vehicle on Lake Michigan Road (which connects the Platte River with M-22), where the speed limit remains 55 miles per hour, even near the mouth of the river where cars line the road for half a mile on hot summer weekends. Rangers from the National Park are teaming up with Benzie County Sheriff’s deputies, Michigan State Police, and the Michigan Department of Natural Resources (DNR) to conduct occasional “saturation patrols” on busy weekends. Sleeping Bear Dunes’s new superintendent, Scott Tucker, is playing close attention to the situation. As many as one-quarter of a million visitors float down the Platte each year, estimates Sleeping Bear Dunes district ranger Joe Lachowski. And most of them float during the high summer months, making this the biggest alcohol-fueled party spot in our National Lakeshore. Lachowski says that numbers have surged in recent years, as Sleeping Bear Dunes has garnered more nationwide attention as a cherished tourist destination. For 25 years, the Park tracked an average of approximately 80,000 vehicles per year on Lake Michigan Road; that annual figure has increased to 86,000 over the past five years. Visitation stats have surged during June and July, which are perhaps the busiest months—the Platte saw 33 percent more traffic in June 2016 over June 2015, and July 2015 saw 31,307 vehicles, the Platte’s single busiest month ever, though Lachowski thinks this July will eclipse those numbers. The number of incidents on Lake Michigan Road, near misses on the river, and complaint calls to law enforcement are increasing, Lachowski says. Twice last year, Benzie County officers were called to break up fights between drunken river-goers. In one case, the offending individual assaulted the officer, too. Glass bottles are prohibited on the river, but Park officials still say that they have to remove a lot of glass. Lachowski also worries that, as temperatures increase during these hot summer days, people drink more and become more dehydrated as they float along. His rangers are concerned about canoers and floaters who do not have a life jacket nearby. After their float, some will walk back along the busy road and then get behind the wheel. He believes that 55 miles per hour is way too fast for Lake Michigan Road. Riverside Canoe Trips, the popular outfitter located where M-22 crosses the Platte just north of Honor, does its part to educate river-goers about the rules and how to stay safe. Riverside customers renting canoes, kayaks, or floaties are required to have PFDs, and they are informed that glass bottles are not allowed on the river. Customers leaving their vehicles on Lake Michigan Road are also told to park completely off the road pavement and to wait at an open space on the roadside for a shuttle ride back to their group. Ranger Joe Lachowski reiterates that the Park’s goal is not to stop people from enjoying themselves, just to promote safety. Editors note: In response to this article, we received a letter to the editor. This letter was published in our August 4th edition. I am writing to you today in regards to the July 21, 2016, article entitled “Booze Cruise: Animal House on the River” in The Betsie Current. I am glad that you brought attention to such an important issue within our community. It is something that we all, residents and vacationers, need to be aware of and dialogue about. My concern is that you associate bad behavior with the assumption that these problem-creating adults are, in fact, college students. I believe that this is an unfair assumption and could be considered poor form. Why label them as college students, as if that is a problem in itself? Why not say “young adults” or even just say an “armada of inebriated people.” Your use of the words “college students” could be considered derogatory and inflammatory. I believe that it is important to encourage young adults to better themselves with education and help them to understand the importance of responsible behavior, instead of just labeling them as problems because they may or may not go to college. I am asking you to take this into account for future articles.